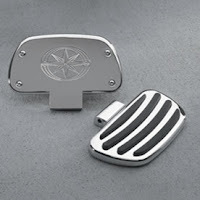 Yamaha Midnight Star 17oo passenger floorboards are available to provide a nice flat surface to rest the whole foot making a more comfortable ride. Two styles of passenger floorboards are available for your bike. Note that mounts are needed to install the floorboards on the bike. See all prices including shipping before purchase at the links below. Fits all model years. Passenger Floorboards - Cast aluminum floorboards with rubber inserts designed to coordinate with the stock rider floorboards. Fold up when not in use. 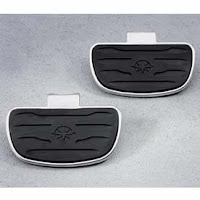 Passenger Floorboard Mounts -Required for Road Star/Silverado. These mounts are specific to the Road Star Midnight motorcycle. Billet Passenger Floorboards - passenger floorboards now incorporate a moulded rubber cushion and ribs. Fold up when not in use displaying Yamaha Star logo. Billet Passenger Floorboard Mounts -Required for Road Star/Silverado. 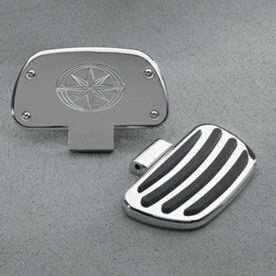 These mounts are specific to the Road Star Midnight motorcycle.